If you are looking for more wrist support while you are bowling this could be the perfect item for you. This wrist support is made of a sturdy vinyl fabric. It is easy to take on and off with the easy on-off Velcro fasteners. This wrist support comes in royal, black, and navy a color will be randomly selected for you. This wrist support is for the right hand. Adjustable finger release pad gives you more lift, hook and power for better pin action. Made of sturdy vinyl fabric with handsome decorative trim and easy on-off Velcro fasteners. Used by many professionals on the PBA tour. Colors: Royal or Black - A color will be randomly selected. By Art from St. Paul Mn. Does it only come in two sizes? Regular size is around medium-large. Yes, it will include a metal support for this Wrist Mate. What dose it look like on the other side? Unfortunately, Master did not provide a picture of the other side of this wrist brace. 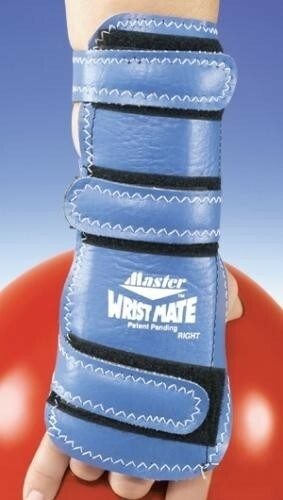 Due to the time it takes to produce the Master Wrist Mate Right Hand ball it will ship in immediately. We cannot ship this ball outside the United States.